KIEV, Ukraine -- Ukraine said on Wednesday it was redeploying troops in the east because of fears that separatists will launch a new military offensive, despite Russia's denials it has sent troops to reinforce the rebels. Militants supporting the self-proclaimed Donetsk People's Republic ride in a truck in Donetsk, eastern Ukraine, November 12, 2014. A ceasefire agreed by the pro-Russian rebels and government forces more than two months ago is now all but dead, and Western fears of a return to all-out conflict are growing. U.S. General Philip Breedlove, NATO Supreme Allied Commander Europe, said the alliance had seen Russian troops and tanks entering Ukraine in the past few days, confirming reports by international observers. "There is no question any more about Russia’s direct military involvement in Ukraine," Breedlove said in Bulgaria. A Russian Defence Ministry official, General-Major Igor Konashenkov, said in Moscow that "there were and are no facts" behind such statements and Russia had given up paying attention to such accusations by NATO. Ukrainian Defence Minister Stepan Poltorak left no doubt that Kiev was also no longer paying attention to Moscow's denials of providing the rebels with direct military support in the worst diplomatic standoff with the West since the Cold War. "We are repositioning our armed forces to respond to the actions of the (rebel) fighters," Poltorak told a government meeting in Kiev. "My main task is to prepare for military action." He gave no details of the troop movements. The ceasefire was agreed in the Belarussian capital of Minsk on Sept. 5 after weeks of fierce fighting between government forces and separatists who rebelled in mainly Russian-speaking eastern Ukraine against the rule of Kiev's Western-looking government eight months ago. The truce has been violated daily, and increasingly since the rebels held what the West and Ukrainian President Petro Poroshenko said were illegitimate leadership elections on Nov. 2. The death toll has passed 4,000 since the truce was agreed, with Kiev accusing Moscow of sending more troops last week. NATO Secretary General Jens Stoltenberg expressed concern about what he called a "significant military build-up". "This is a severe threat to the ceasefire," he said. "I call on Russia to pull back its forces and equipment from Ukraine, and to fully respect the Minsk agreements." President Vladimir Putin has accused the West of instigating a coup that ousted a Moscow-backed president in Kiev in February after months of street protests, and of trying to use the crisis to prevent Russia's rise as a global power. Russian Foreign Minister Sergei Lavrov told U.S. Secretary of State John Kerry by phone that the ceasefire deal must be upheld, rejecting accusations that Moscow is to blame for its collapse. 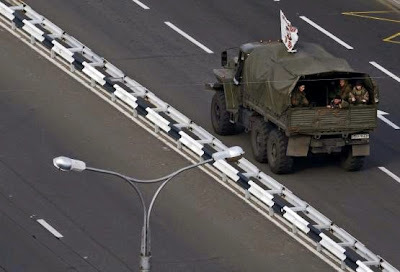 A Reuters reporter, however, saw unidentified military trucks in the centre of Donetsk on Wednesday, with soldiers in green uniform without insignia standing nearby. Russian soldiers spotted by local residents have often worn no insignia. Kiev's fear is that Putin, who annexed the Crimean peninsula from Ukraine in March, wants to expand the territory controlled by the separatists with another military push like the one that turned the tide in the rebels' favour in August. Moscow denied sending in troops and armour in August but said some Russians may have been there as volunteers during their holidays. A large number of Russian soldiers are among the dead in the conflict. The prospect of all-out war returning to eastern Ukraine has piled pressure on the country's struggling economy, sending the hryvnia currency plummeting. The cost of insuring exposure to Ukraine's debt hit five-year highs on Wednesday, while its dollar bonds were sold off heavily. Russia is also suffering an economic downturn aggravated by Western economic sanctions over the conflict, with the rouble falling nearly 30 percent against the dollar this year. But Putin has shown no sign of changing policy on Ukraine and the EU has signalled it will not ease sanctions on Russia when it meets to discuss them next week.